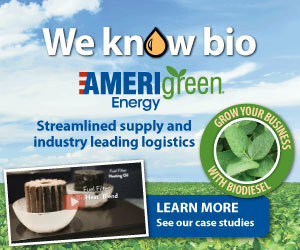 Air Liquide Engineering & Construction has built six biodiesel plants for Cargill. Now, its leading-edge Lurgi biodiesel technology, which offers a complete oleochemical production chain, will be the heart of Cargill's new 60 MMgy Kansas plant. Agron Bioenergy closed the sale of its biodiesel plant in Watsonville, California, to Western Iowa Energy. The assets include a biodiesel refinery designed to produce 15 MMgy and patents encompassing Agron's centrifuge system and distillation steps. The U.S. EPA has officially announced its denial of several petitions requesting the agency initiate rulemaking to change the point of obligation (POO) under the RFS. In 2016, several groups petitioned the EPA, asking that the agency shift the POO. Medford Township Public Schools in New Jersey is celebrating its 20-year anniversary of transitioning to cleaner-burning biodiesel in its school bus fleet. Medford is the U.S.'s longest continuous user of biodiesel in a student transportation fleet. Electrification is gaining popularity, but for medium- and heavy-duty applications, there is no replacement for diesel power. Deutz has approved the latest generation of its entire TCD engine range for operation with renewable diesel and biodiesel. Starting Nov. 28, nearly 100 members of the National Biodiesel Board are in Washington, D.C., to participate in their biannual fly-in to the nation's capital. NBB members plan to storm the Hill to encourage reinstatement of the biodiesel tax credit. Executive leaders of the National Biodiesel Board have sent a letter to U.S. President Donald J. Trump on the 2018-'19 final rule for the Renewable Fuel Standard, which the White House Office of Management and Budget is currently reviewing.